"I've traveled the world and never found a place that treated my family as well as Dwel." We believe that service should be uniquely personal. Every time, all the time. Everyone on our team understands that each guest is a unique individual and works hard to provide service that is tailored to their needs, not ours. Some call it white glove, others call it VIP. We just call it treating others like you want to be treated. Airport pick-up and personal meet & greet. No lock boxes here. 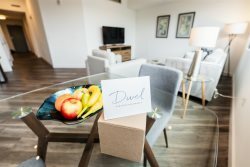 Customized welcome gift, fresh fruit, organic snacks and bottled water. 24 hour concierge & personal assistant services.